No more lost or dropped soothers! BPA free. Please read and retain this important information. Soother Saver Instructions for Use Pull up the top clasp to open, place open clip over clothing and close the top clasp of the soother saver to attach to clothing. To release, open the top clasp of the clip. Cleaning Wash in warm soapy water, rinse in clean water, remove excess water and dry flat away from direct heat. Do not clean with solvents or harsh chemicals. Suitable for use with ringed soothers only. Soother Cleaning & sterilisation Before first use place the soother in boiling water for 5 minutes, allow to cool and squeeze out any trapped water from soother. This is to ensure hygiene. In the event that the soother becomes lodged in babies mouth, do not panic, it can not be swallowed and is designed to cope with such an event. Remove from mouth with care, as gently as possible. Replace the soother after one month, for safety and hygiene reasons. Clean before each use. Wash in warm soapy water and rinse in clean water or use a dishwasher. Remove any water that may have entered the teat by squeezing the teat. Do not clean with solvents or harsh chemicals. Suitable for all forms of sterilisation. Do not store in direct sunlight or near a source of heat. Do not store or allow to come into contact with solvents or harsh chemicals. Never dip teat in sweet substances or medication, your child may get tooth decay. Always use this product under adult supervision. WARNING:<br>DO NOT TIE SOOTHER SAVER AROUND CHILD'S NECK AS IT PRESENTS A STRANGULATION DANGER<br><br>Soother Saver<br>For your child's safety WARNING!<br>Before each use check carefully. Throw away at the first signs of weakness. 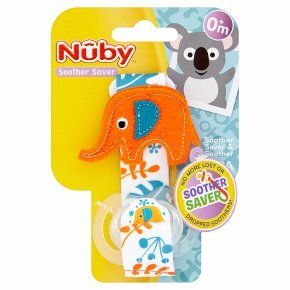 Never lengthen the soother holder! Never attach it to cords, ribbons, laces or loose parts of clothing. The child may be strangled.<br><br>Soother<br>For your child's safety WARNING!<br>Only use dedicated soother holders tested to EN12586. Never attach ribbons or cords to a soother, your child may be strangled by them. Inspect carefully before each use, especially when the child has teeth. Pull the soother in all directions. Throw away at first signs of damage or weakness. Do not leave a soother in direct sunlight or near a source of heat, or leave in disinfectant ("sterilising solution") for longer than recommended, as this may weaken the teat.